Growing up in Philly, I know first-hand how it’s hard to make it out without being jaded. I was fortunate enough to go to some of the best schools in the area, but that came with major sacrifices from my parents. 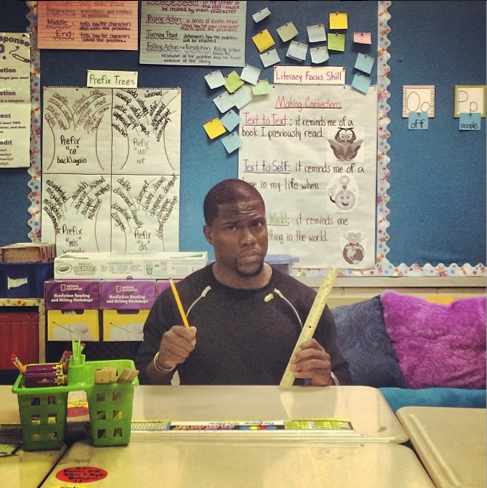 I wish that other kids had the opportunities that I had because maybe they would have a better chance to move up and be great…and that’s just me…imagine what it’s like for someone like Kevin Hart who was raised up in the Philadelphia public school system and has to watch the city he loves, climb out of a crisis. I felt like the city was in a time of need. I feel like it’s good to step up and show kids that regardless of where I’m at in my life now, I once sat in the same seat they sit in…this is definitely a start of something big for me. I’m jumping into this philanthropy world and for me, this is where I wanted it to start. Then by accident I found my lane, helping my city. That’s my lane. Trying to put my city on my back, uplift it and showing these kids that I give a damn. By showing them that I give a damn, hopefully, it’ll keep them interested to stay in school and make it out like I did. KUDOS to you, Kevin Hart! We need more people like you who can turn back around to help out the city that made them…Philly needs it! Not Sure What to Do for HU’s Homecoming? Here Are Some Parties to Check Out!